based on 'spirituality' and the ancient principle that 'Natural Foods are meant to Feed & Heal'. aids digestion; cleans, nourishes & alkalizes the blood, boosts immunity, improves energy and circulation, plus enhances overall 'whole-body' health. 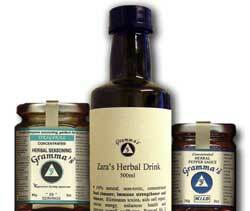 Exuding an explosion of deliciously rich aromas and flavours, which has become the distinctive hallmark of GRAMMA'S. Raised on good old fashioned home-cooked meals, Dounne appreciates its valuable importance to family relationship and health. Therefore, she specifically developed each product with all the essential ingredients required, to inspire and excite you to become more creative in the kitchen. So EASY TO USE - Gramma's gives you the tools and confidence to prepare delicious, mouth-watering, healthy meals for you, your family and pets. Dounne says:- "Healthy eating should begin at home, with cooking as an enjoyable, health enhancing, shared experience. It is my hope that Gramma's products will encourage you to 'breathe life' into your meals and take 'health' back into your own hands". 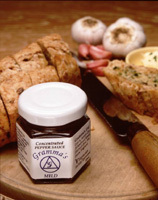 Gramma's products are approved by the Vegetarian Society.